Increased consumer interest in purchasing locally-produced food is creating market opportunities for Forsyth County farmers that have rejuvenated the traditional practice of growers bringing seasonal fruits and vegetables and fresh eggs and dairy products into towns to sell on a regular basis. Farmer’s markets in downtown Winston-Salem, at the Dixie Classic fairgrounds, in Reynolda Village, and at many other locations throughout the Piedmont provide farmers with venues at which they can sell their produce from May until October. Restaurants and retailers purchase farm products in order to meet market demand for organic food grown in a sustainable manner. Several entities have instituted Community Supported Agriculture (CSA) programs. The Triad Farm to Table Cooperative, organized with the assistance of the Forsyth County Cooperative Extension Service, sold 12-week subscriptions for weekly or bi-weekly produce delivery to pick-up locations throughout the county beginning June 1, 2011. Lowes Foods also sought to capitalize on demand for fresh produce by creating the Locally Grown Food Club, which offers consumers the opportunity to purchase subscriptions for weekly boxes of approximately 12 pounds of seasonal fruits and vegetables. Lowes partners with cooperatives including Pilot Mountain Pride, an organization of about 50 Piedmont farmers who have begun growing produce rather than tobacco, as well as other North Carolina growers. Residents interested in learning more about growing their own fruits, vegetables and herbs in group settings have benefited from the Forsyth County Cooperative Extension Service’s Community Gardening Resource Program, a training program funded by a Winston-Salem Foundation grant. The extension service mentors entities interested in establishing new community gardens or improving existing sites. So far, at least forty groups have availed themselves of the opportunity to plant gardens at locations ranging from neighborhoods to parks and churches. 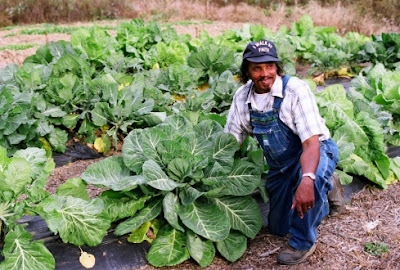 These initiatives represent only a few of the many ways that Forsyth County residents continue to benefit from local farming and gardening endeavors. The area’s lengthy agricultural heritage, ranging from the Moravian’s communal eighteenth-century gardens in Bethabara to community-supported agriculture in the twentieth-century, is an integral component of the county’s distinctive character.